Queens Park Rangers failed to secure a first Premier League win of the season, despite enjoying a man advantage during a breathless finale at Loftus Road. Everton held firm after controversially losing Steven Pienaar to a second yellow card with 30 minutes remaining. QPR had snatched a second-minute lead when Junior Hoilett ran 60 yards and found the net with a deflected shot. Everton struck back through a Julio Cesar own goal and both sides might also have been awarded penalties. This is the 12th time a team has failed to win any of their opening eight Premier League games. Five of the previous 11 avoided relegation. Steven Pienaar's red card was Everton's 74th in Premier League history, only Blackburn (76) have more. Junior Hoilett's goal is the earliest QPR effort in league since Les Ferdinand after two minutes versus West Ham in December 1994. 15 goals is Everton's best ever return after eight games of a Premier League season. The result leaves QPR bottom of the Premier League table and manager Mark Hughes under growing pressure. Having left Fulham, who are eighth, on the grounds they failed to match his aspirations, the Welshman would surely take survival even at this early stage of the season. Given his predicament, keeping his job for the next few weeks may be a more immediate target, but with the next league game away to Arsenal there is little sign of respite. With confidence wavering and the Loftus Road crowd in need of something to shout about, QPR came flying out of the traps, catching Everton cold. The visitors won two early corners but from the second Rangers broke with the kind of pace and purpose their attacking play has often lacked this season. Hoilett surged down the centre of the field, holding off the challenge of Phil Neville before unleashing a low shot that clipped the heel of Leighton Baines and looped beyond the wrong-footed Everton goalkeeper Tim Howard. The goal energised QPR, their passing improved and for 30 minutes they dictated. Adel Taarabt produced his usual array of tricks, Ryan Nelsen - preferred to Anton Ferdinand in defence - headed a corner over and Bobby Zamora caused havoc. But Everton are a formidable outfit and their sheer physicality enabled them to gain a foothold on the game, with the tireless Jelavic a constant threat. The Croatian tested QPR goalkeeper Cesar with a low free-kick early on and he won another from which Everton struck back. Baines' free-kick 10 yards into the Rangers half was lifted towards an unmarked Sylvain Distin five yards from goal. The Frenchman headed the ball onto the base of the post and it bounced back on to Cesar and back over the line. Such is the fragility of confidence at Loftus Road that QPR briefly went to pieces. Within 90 seconds of the goal, Everton might have struck twice more. First QPR midfielder Stephane Mbia appeared to trip Jelavic in the penalty area before Phil Jagielka headed a corner against the crossbar, having been granted the freedom of the penalty area. Everton were snapping into the challenges now, no more so than Pienaar. The South African was shown a first yellow card five minutes into the second half, was warned for a challenge on Hoilett soon after and was unfairly shown a second yellow by referee Jon Moss on 61 minutes after colliding with Jose Bosingwa. Moyes's side were far from finished, however. A curling Baines corner once again caused havoc in the QPR defence, with Jagielka twice going close in a scramble. Spaces were beginning to appear in the Everton defence. 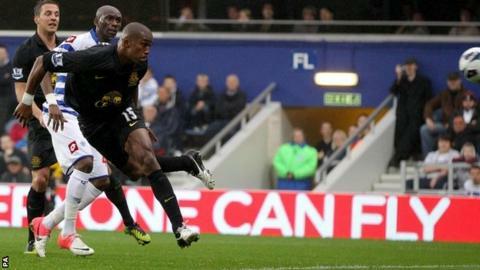 Hoilett skipped past Leon Osman only to see his fizzing low shot turned away by Howard. The former Blackburn winger was leading QPR's charge now, with his fearless running and willingness to shoot on sight. He tested Howard again moments later before going down under a mistimed challenge by Seamus Coleman in the penalty area. QPR's penalty appeals were waved away and Everton held firm to earn a point. QPR manager Mark Hughes: "We made an excellent start and got our reward. Junior Hoilett made things happen and I thought he was excellent all game. "All in all it was a decent game and we are just a little disappointed in so much as we have not got three points. "We are getting better and I think everyone can see that. The frustration I think is that we haven't got the points to back up the performances. "We have shown against almost every team we have played against that we can compete in this league. That gives us comfort because we know we have good players in the building and they are getting fitter."